Pablo Sandoval left Wednesday's game with an injury which has been determined to be a fracture of his left hamate bone. Yes, that is the same injury he suffered in 2011. Giants fans hoping that Pablo Sandoval's injury on Wednesday wouldn't result in a repeat of 2011 when Sandoval missed time are in for some bad news: the third baseman's injury has been diagnosed as a fracture of his left hamate bone. Yes, that should sound familiar, because one year ago today, on May 3 of 2011, we wrote that Panda would miss four-to-six weeks because he required surgery on a fractured hamate bone. That was his right hand, so there's something different, but not much other than which hand it is. Panda is expected to be put on the 15-day disabled list and Conor Gillispie, who is already in San Francisco, will be recalled to take his place. Hank Schulman of the San Francisco Chronicle tweeted that "Pablo seemed in decent spirits but said he was asked not to talk [about the injury]. [He] has signed a HIPPA waiver so trainer can talk." Giant closer Brian Wilson sure has a good attitude about his season ending injury to his throwing elbow. Andrew Baggarly of CSNBayArea.com writes that "Sandoval tried to play through pain from fractured left hamate the last couple [of] days. [The] pain became unbearable [Wednesday]." Last year, Sandoval played through April 29, when he suffered the injury, and returned from surgery and the disabled list on June 14. "The best way to describe it is, it's a bummer," Brandon Belt said, via Schulman. 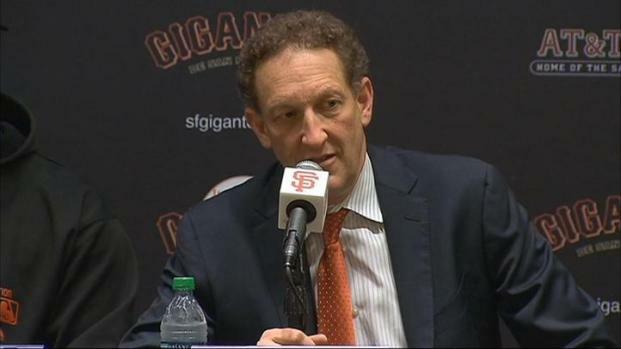 The Giants announced a five-year extension for pitcher Madison Bumgarner on Monday afternoon.